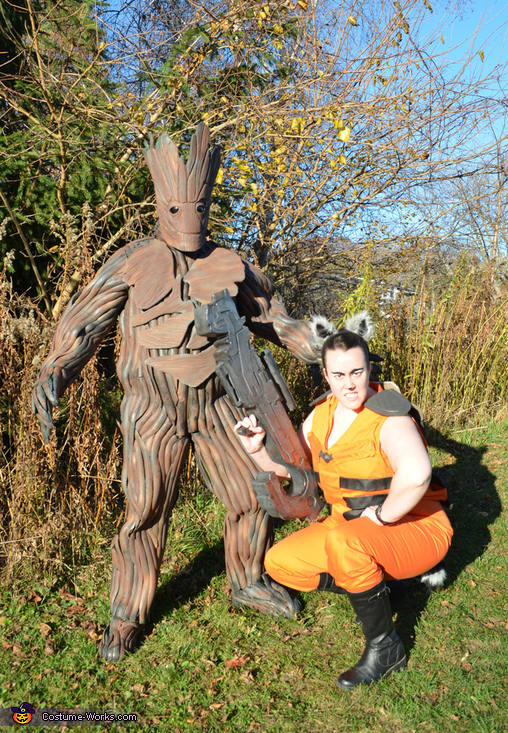 My wife and I decided to create Rocket and Groot costumes this year. All of the costumes were hand fabricated. The orange jumpsuit was sewn and fit for my wife who is pregnant. The vest was sewn and decorated with eva foam parts and faux leather straps. The backpack was eva foam floor mats cut and heat formed. The gun was created from EVA foam and various craft foams. The barrels and scope were different types of pvc pipe. The Groot Head was fabricated from EVA foam floor mats.The eyes were made from clear ornaments which were cut in half and tinted using headlight tint. The groot body was a flight suit layered with different sizes of pipe insulation & spray painted. The hands and feet were shoes and gloves with more pipe insulation. The bark plates were carved from more eva foam. This project took us over 180 hours of work.